Ema-do of the Kitano Tenmangu (北野天満宮の絵馬堂) in Kamigyo-ku, Kyoto, ca. 1880s. Ema are small wooden plaques that convey requests to the gods, or thanks for wishes granted. Many temples and shrines built special buildings, called ema-do, for these plaques. 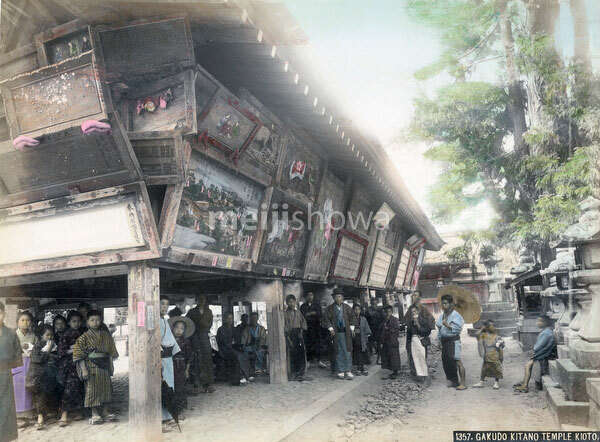 The Kitano Tenmangu Ema-do played an important role as a gallery where many beautiful ema could be admired. Kitano Tenmangu is an important Shinto shrine founded in 947 to appease the angry spirit of scholar, poet, and politician Sugawara no Michizane (菅原道真, 845–903).